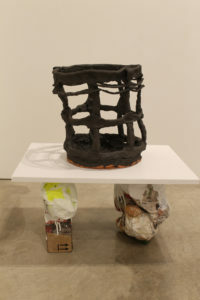 James Harris Gallery | Alwyn O'Brien: "Astride the Bucket"
James Harris Gallery is pleased to present our third exhibition by Alwyn O’Brien titled Astride the Bucket. 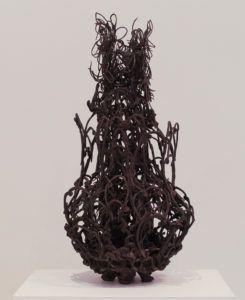 Inspired by Italo Calvino’s “Six Memos for the Next Millenium” and Franz Kafka’s short story “The Knight of the Bucket,” O’Brien’s earthenware and porcelain sculptures push the medium as a vehicle to explore the question “What is the Vessel?” With an extensive knowledge of the history of decorative artists and a passion for the baroque, O’Brien’s objects dissect the definition of the vessel through her use of lacey hand rolled coils used in a deliberate yet chaotic way to construct volume and shape. Pinching, rolling and fingerprints show signs of the hand and connect the material to body. As you enter the gallery, two sculptures reference finial garden ornaments that echo the shapes of acorns or pineapples. 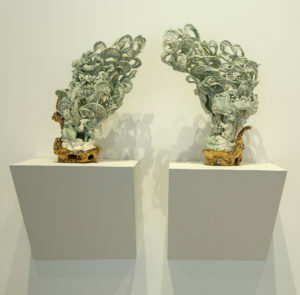 Seen as both markers for a beginning and end, these two works act as gatekeepers, yet their delicate form on the verge of collapse suggests otherwise. 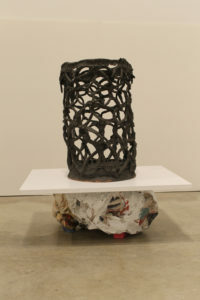 Placed around the floor of the gallery are earthenware buckets, their open organic lattice-like form emphasizing the contained and uncontained. Like all of the artist work, there is a slippage not only implied in the content but also in the forms themselves. 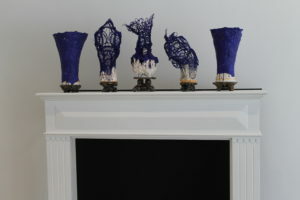 Mounted on the wall is a garniture of five cobalt blue vessels. Their rhythmic shapes counterbalance each other while intentionally exposing the disintegration of historical narrative. The entire show is an investigation of what we can hold, carry or catch, either as descent or ascent into a place; a place of constant flux so prevalent today. 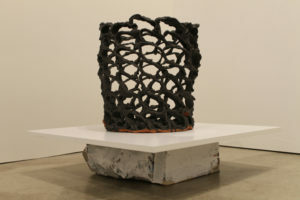 It is the objects themselves through their awkward beauty and gestural expression that begin to push the materiality into a new contemporary vocabulary of clay. 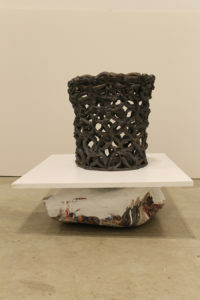 Alwyn O’Brien’s ceramic practice has taken her across Canada, studying at Capilano College, in Vancouver, Sheridan College of Ontario, the Nova Scotia School of Art and Design, and Emily Carr Institute of Art and Design. She received her MFA in 2010 from the University of Washington in Seattle and her BFA from Emily Carr Institute. 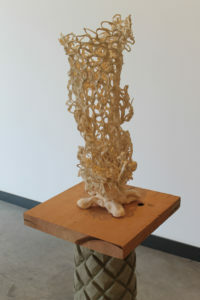 Her work is featured in the collections of the Seattle Art Museum, the Surrey Art Gallery, and the Mackenzie Art Gallery. 23 1/2" x 11" x 11"
23 1/2" x 54 1/2" x 10"
17 1/2" x 25" x 8 1/2"
23" x 10" x 8"
28 3/4" x 26" x 16"
24 1/2" x 22" x 16"
21" x 22" x 27"
24" x 16 7/8" x 21 7/8"